Warehouse solutions experts for over 30 years! 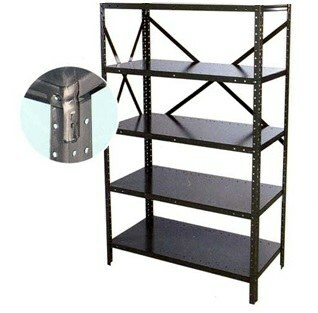 48 x 18 x 85 inch light-duty shelving adder unit with 5 shelves is an affordable option for light to medium duty storage. Experience the same high-quality construction as standard shelving, but with lighter 20-guage steel. Non stock item. Ships from factory. Freight charges apply. Call us for best pricing options! Copyright © 2019 Warehouse1. All Rights Reserved. Still planning and shopping around? We get it. A lot goes into getting the most out of your space for the best value. We're here to help. Sign up for our newsletter and get great deals and expert advice to keep things running smoothly. As a bonus, we'll throw in 5% off your next purchase! As always, our expert consultants are standing by to aid with anything you need, from which shelves to buy to match your existing system, to planning an entire new space from the ground up. Your order contains a larger quantity than we have in stock. Our experts deal with this all the time! Give us a call and one of our experts can help you determine the best way to address your unique challenge. Offer a different direction altogether that might work more effectively, cheaply and/or quickly solve your challenge.